Going to Heaven is strictly protected by copyright. Uys's reworking of the play is strikingly effective. His dramatic change of the gender and sexuality of the original — which had three women protagonists — is a masterly stroke that allows the play to represent the fearful, apocalyptic vision of the future as seen through the eyes of minority groupings here and now. It also enables it to demonstrate the descent into accepting as everyday what were once unspeakable horrors. The writing is peppered with one-liners and a lot of uncomfortable home truths. Pieter-Dirk Uys's Paradise is Closing Down has been revised and honed to capture the political ambience of present-day Cape Town. He has made a good job of it. No farce, it's outrageously funny, yet succeeds in providing the current apocalyptic view through the goings-on of a trio of hedonistic gays. Hierdie erg-hernieuwde weergawe van Uys se Paradise is Closing Down wat in 1977 vir die eerste keer opgevoer is, is meer kompleks as wat dit aanvanklik wil voorkom. Tussen al die onvermydelike lagbuie deur loop 'n draad kul sinisisme en tasbare somberheid. Die drie mans is almal eensame figure wie se persoonlike probleme en seksualiteit deur die onsekerheid van Suid-Afrikaner-wees net vererger word. What a drag! An extremely witty and engaging camp comedy with teeth. The focus moves from the particular — the wonderfully pretentious world of three gay men — to the general: contemporary South Africa. This must be the freshest interpretation of a changing South Africa; Paradise as it closes down. Living in a place like this at a time like this, it's good to see a playwright readdressing, reassessing and redecorating his work. Uys has made a few startling changes. 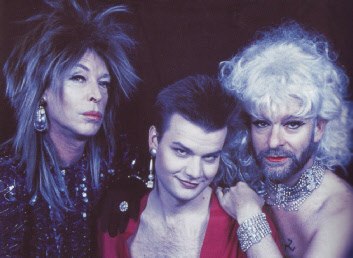 The three women are now men, ludicrously attired in drag because they are off to a gay club. When they take time off from bemoaning their fate and slating each other, they comment on the situation. And, while their views are clearly coloured by their own bias and limited perception, it is clear that the prospect of paradise in the 'new' South Africa is no more rosy that it was in the old. It is a diverting piece, with the celebrated Uys wit in full flush.